Great news! 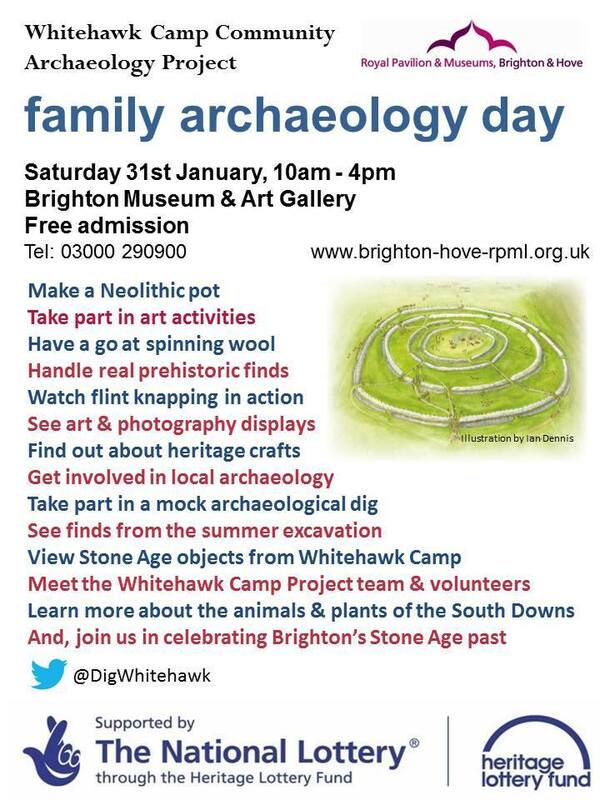 The Newmarket Farm Dig project is to participate in the Family Archaeology Day at Brighton Museum, Saturday 31st January 10am-4pm. We hope to have lots of pictures as well as finds from our last dig on display. Archaeologist, Hilary Orange, wearing her manager’s hat for the Whitehawk Camp Community Archaeology Project passed on this invite – our biggest venue yet – which gives us a wonderful opportunity to share some of the amazing history we have been discovering about the Downs between Brighton and Lewes. The Whitehawk Neolithic causewayed enclosure (to give it its proper name) is located on the hill top immediately east of Brighton, partly under the start of the Racecourse. It is one of the oldest ritual monuments in Britain, built at a time when the whole of Sussex may have consisted of just a few dozen families. They were the first to start farming the South Downs, and would have had to come from far and wide to help in the construction of such a large monument, and to participate in the ritual gatherings held some 500 years before the building of Stonehenge. Last year the Whitehawk Camp Community Archaeology Project received funding to research, promote, and protect this little known, nationally important site. Interestingly, for our project, looking at the very much more recent history of this area of the Downs, the next big ‘ritual’ gatherings on Whitehawk Hill were those organised by and for that great and (in)famous ‘tribal leader’ the Prince of Wales (later to become George IV)! His greatest monument was the building and decorating of the Royal Pavilion in Brighton – very different from the banks and ditches of the nearby hilltop. He initiated, and participated in, several huge mock battles on the South Downs east of Brighton, involving thousands of troops, and tens of thousands of spectators from both Britain and Europe. These military events became a regular spectacle right through the nineteenth century. In 1862, 132,000 people were reported to have travelled by train to Brighton to participate in one of these events. On the day of the main event, the evidence seems to be that spectators gathered on the first available open downland outside Brighton for a picnic – by the Racecourse on Whitehawk Hill. From its associated ridge top (now known as the Race Hill, which leads on behind modern Woodingdean onto Newmarket Hill) magnificent views are to be obtained of the hills and deans in which they held they ‘battles’. 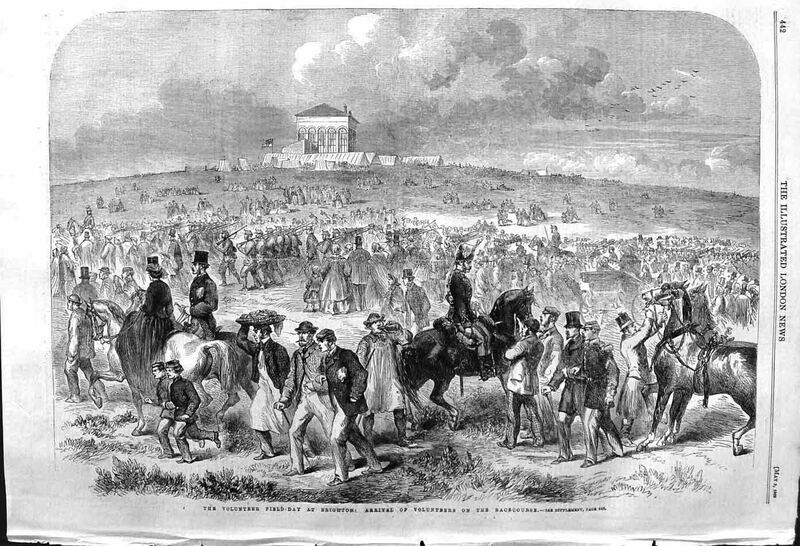 Volunteer Field-Day at Brighton: Arrival of Volunteers on the Racecourse; Illustrated London News, 1862. I may be wrong, but I understand that the Whitehawk Camp archaeologists digging in the vicinity of the Neolithic enclosure last August, instead of their hoped for prehistoric remains, apparently found large quantities of what appeared to be nineteenth century picnic debris. Luckily Hilary Orange is an archaeologist with an interest in such relatively modern ‘rubbish’ and asked for it to be saved. The images I show here may well be able to help the police identify some of those responsible for littering such an historic monument! 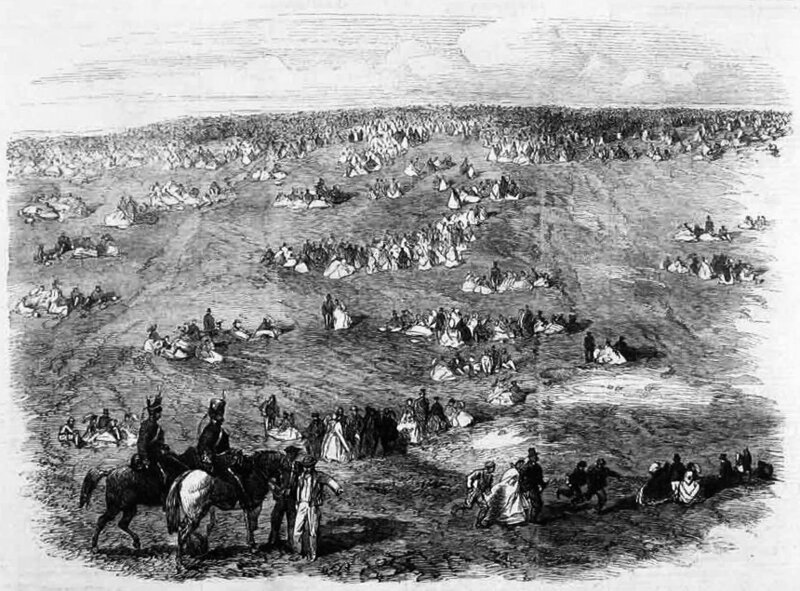 Volunteer Field-Day at Brighton: People on the Downs; Illustrated London News, 1862.